Crystal Diamond Livestock Co., Ltd. is one of the leading Livestock Company in Myanmar. It is a part of Sein Wutt Hmon Group of Companies and running Livestock business widely. 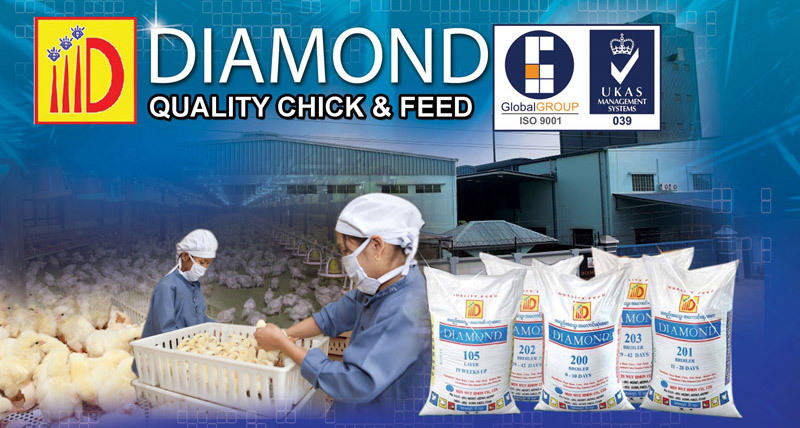 Crystal Diamond Livestock Co., Ltd focuses on to become a company that can provide integrated poultry services in Myanmar. From grandparent stock farms to parent stock farms, Crystal Diamond Livestock supplies parent stock chicks and day old chicks to customers throughout the country under the brand name “Diamond”. Diamond quality meat is a well known and recognized brand in the industry and has a proven record of success in addition to a large local customer base. With a vast experience and knowledge in the poultry industry, we are in depth understanding of our customers’ needs and we ensure customers to receive the best quality of Diamond parent stocks and day old chicks with the best performance. Merial vaccines: Merial is a world leading animal healthcare company which provides a comprehensive range of products to enhance the health, well-being and performance of a wide range of animals. Merial produces pharmaceutical products and vaccines for livestock, pets and wildlife (including endangered species). Coophavet medicine: Coophavet is a group of Merial which produces poultry pharmaceutical products such as antibacterial, anti inflammatory, nutritional, antiparasitics and hygiene which are originally produced from France. Octa Medicine: Octa Memorial Co., Ltd. is one of the major distributors of animal health products in Thailand. Octa veterinary medicine is a famous brand and one of the best selling animal health products in Myanmar.